A theory suggesting that prices and returns eventually move back towards the mean or average. Today’s release of the S&P Case-Shiller Home Price Index was a mixed bag. A modest rise nationally, but a modest decline locally here in Miami. With no big news, let’s pull the camera back and look at another data set from a long-term perspective. 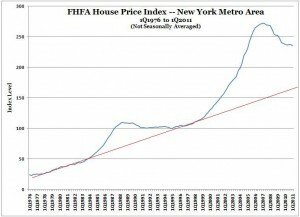 The FHFA House Price Index reflects transactions involving Fannie Mae and Freddie Mac. This is not the luxury market, but it’s a reliable indicator of overall market conditions. It went up during the boom, and it’s been coming down during the bust. 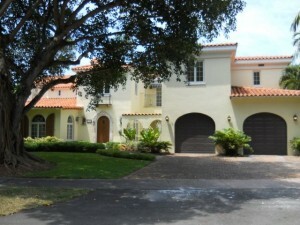 The FHFA index suggests risk that prices will fall further here in Miami. If prices are to revert to their long-term trend line (in red) — and don’t bet they won’t — then Miami real estate remains about 25% overvalued. The overvaluation needs to be worked off as a function of price and time. Prices can get back to the long-term trend line by falling fast, going sideways while the long-term trend line catches up, or more likely, some combination of falling prices and passage of time. Continuing to validate the proposition that price declines are migrating up the food chain to bigger, costlier homes in Miami and Coral Gables, several Gables homes in the 5,000-sf range have recently sold for about $200/sf. The 5,530-sf historically designated home at 2027 Alhambra Circle sold for $1,025,000, or $185/sf. 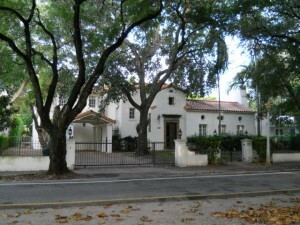 Around the bend and toward town, the 4,960-sf 1930s manse at 756 Alhambra Circle sold for $1,138,000, or $229/sf. Another classic old home, the expanded 6,528-sf spread at 2200 Segovia Circle, sold for $1,350,000, or $206/sf. 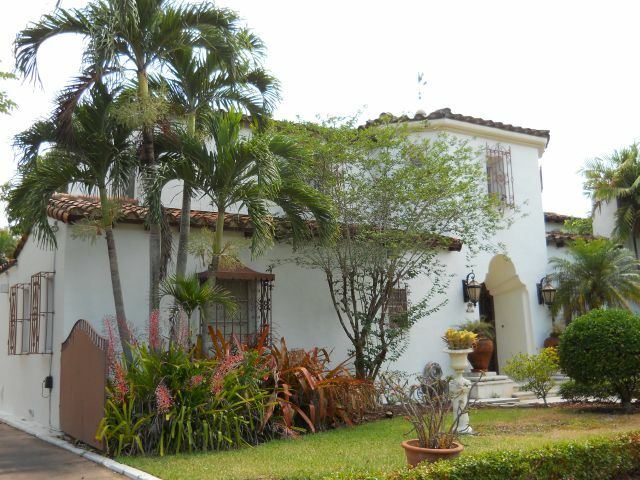 If you’ve been planning to buy a big house in Coral Gables, your patience has been rewarded. Now you can shop and negotiate with much less fear of loss. Properties like these were selling for more like $400/sf at the peak. That was maniacal, of course. But at $200/sf, these classic Coral Gables homes are back to roughly 2001 prices, completely unwinding the excess appreciation of the bubble years. Of course, any collapse in asset values can overshoot to the downside, and there is risk of further price declines. But the risk of loss is a lot less than it was before. Stay tuned for another post with charts showing the trajectory of prices for big homes in the 33134 zip code of Coral Gables.